Imagine a world where curious kids become hands-on inventors who discover they're lovingly crafted by God. 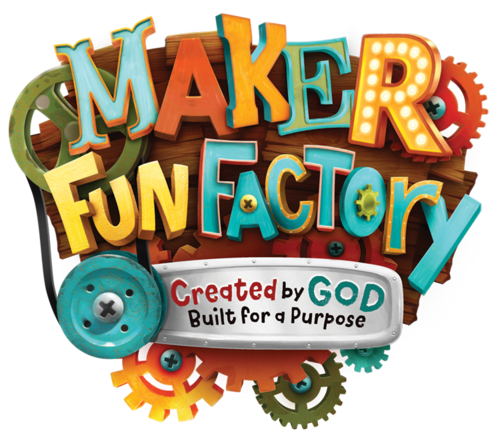 Join us for Totally Catholic Maker Fun Factory Vacation Bible School! Register your kids today and/or sign up to volunteer as a leader or helper. VBS will be held June 12-16, 2017! Registration will take place from April 1st-May 14th. VBS is offered to children: Preschool – Entering Fifth Grade (To participate in the program, preschool aged children must have turned 3 years old by January 1, 2017, and be toilet trained.) Space is limited and registration will be closed on May 14th or when we have reached a maximum of 150 participants. STEP ONE: Register your children by clicking Register Participants. STEP TWO: Pay VBS registration fees on this page or via your confirmation email. We need ADULT and YOUTH volunteers in all areas!! CHILDCARE IS PROVIDED for any adults who would like to volunteer during VBS!!! Please click on the volunteer link to sign up!! Parents…we are encouraging each parent to volunteer one morning (8:30am -11:30am) or afternoon (11:30am-2:30pm). This will give you an opportunity to see what your child will be experiencing at VBS as well as assist the VBS team in making your child's week at VBS be the best week of their summer!! If you would like to help sponsor a child for VBS please click the DONATE button to the right! Fuel the Factory-DONATE ITEMS or FUNDS!! !